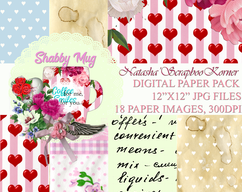 You are purchasing the digital file for printing at home with the Shabby Mug Printable Digital Paper Collection with Templates and Ephemera. This digital set comes as a ZIP file. You have to "UNZIP" it in order to work with files. Each file is PNG & JPEG format. 300 pixels/inch. You can use it for all your handmade projects printing it on and on.